Products go through several phases throughout their lifetime and companies need to know how to price accordingly. When a product is introduced, it will go through periods of growth, maturitym and the inevitable decline. This is referred to as a product lifecycle and companies that understand how they work will be better equipped at pricing their products at the different phases throughout a product's life. Products will go through a development phase, introductory phase, growth phase, maturity phase, and the decline phase. Here are some pricing strategies for businesses to consider at each stage of the process. The development stage is when the conceived idea is turned into different prototypes and tested by being given to small groups to evaluate the product and receive feedback. There is no distinct pricing strategy to use at this stage simply because the product isn't marketable yet. Once the product has been evaluated and feedback has been given, the business is ready to move onto the introductory phase. This is the phase when the product is introduced to a market when it can either succeed or fail. If the product finds buyers that are interested in the product, then it will move onto the next phase, the growth phase. There are a few ways to price a product that is in the introdcuction phase. The business can demand customers to pay a premium for their product if ther have been technological advances added to the new product or if the product is an entirely new piece of technology. However, if the product is so unique that customers need some time to really understand its potential, then a high price for the product is not ideal. A reduced introductory price, even a freebie, works well in these situations as it allows customers to ease into a product they are unfamiliar with. 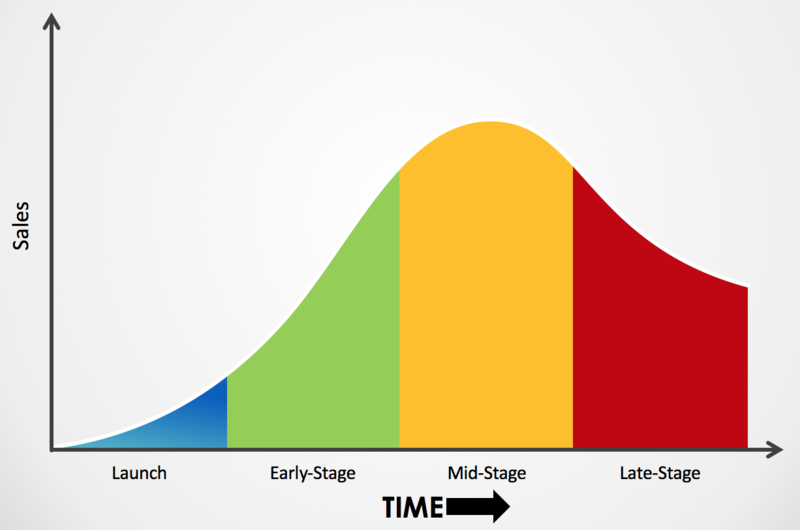 The growth phase occurs when a product is gaining traction and discovering new markets and customer demographics. After a certain period of time, that growth with plateau due to market saturation. Throughout the growth phase, businesses will be able to increase production, which reduces the cost per unit. If a company can reduce its product prices while maintaining healthy profits, then the popularity of the product will continue to drive high profits. The high profits will also allow companies to expand into new markets and new distribution channels. The maturity phase comes into effect when the growth of a product plateaus. Adding to that, the market has been fully penetrated and the product is stable. A contributing factor of the maturity phase is that competitors may have started offering something similar. The maturity phase is also the best time for companies to make the most money because they will have plenty of information about the marketplace and the production costs are no longer an issue. As long as companies find ways to stand out from their competition, they will continue to cash in on their product. If competitors start using cost-cutting tactics, the business should do the same since they'll still be able to profit. This is the phase where the product that was initially hailed as groundbreaking starts to become edged out by the market or better products within the market. New products and new technologies will also come along and sales for the original product will begin to dip. Companies know all there is to know about the manufacturing process and costs are as low as they will ever be. They are in a position where they can lower price to keep the product as low as possible. Companies have other products going through different parts of the product lifecycle so a drop in demand for the older product won't lead to many problems within the business.